We are past a week in the Lent season and I am scratching my head to come up with new vegetarian items to appease my whole family. I and my husband can live on steamed veggies and grains, but when it comes to my kids, I have to be cautious around those picky eaters. While growing up in Kerala, I never felt a difference during Lent season as my Mom used to cook variety of vegetarian dishes and there were many options to choose from. I miss those authentic Keralite dishes. My grandma used to whip up a lip smacking dish from anything she founds in her backyard garden. Nothing seemed to be wasted, the seeds, the skin, the flesh you name it were put into use. The unused parts of vegetables used to go into the compost pit which makes its way to the produce in the garden as fertilizers. I always wished to have a compost maker in my backyard. I have to think seriously to at least compost the vegetarian waste and use it in my garden in summer. Do you waste lot of food? Lately I am diligent in making use of all the items I shop from grocery store. I almost made my daughter promise to not waste her lunch that I pack for her school. It feels good when you can make a small difference and influence your family. I strongly believe that the 'Change has to begin in yourself before you can correct anyone else'. Hope we can together make a difference by making a change in ourselves and influencing others. I wanted to make use of the butternut squash and the buck wheat that was sitting in my pantry for some time. Kids were at school and both of us were home that day and I had to do an easy lunch fix for us. 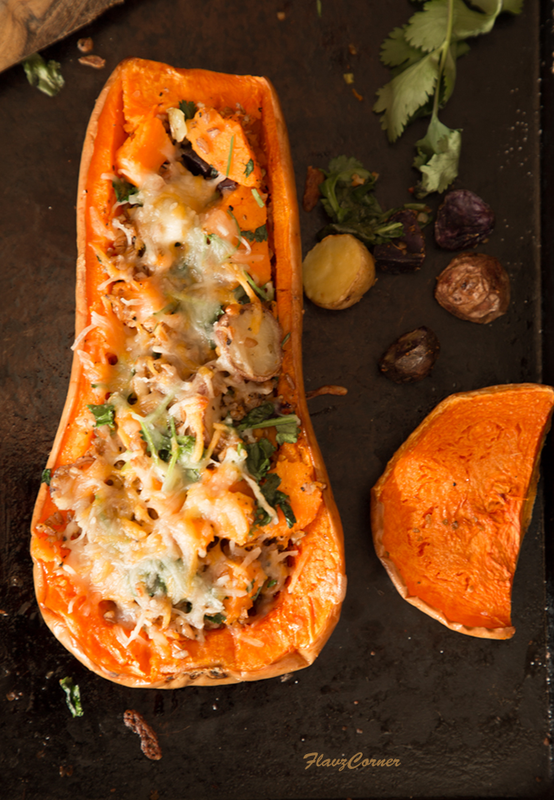 We enjoyed the spicy butternut squash boats that were surprisingly delicious and filling at the same time. 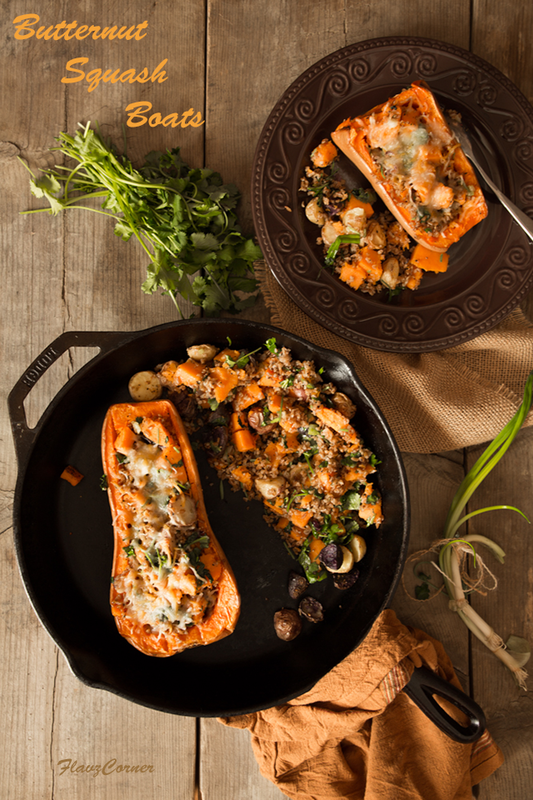 You can be creative about the filling that you add in the squash boat. Both sweet and spicy filling can be used and limitation is just your imagination. 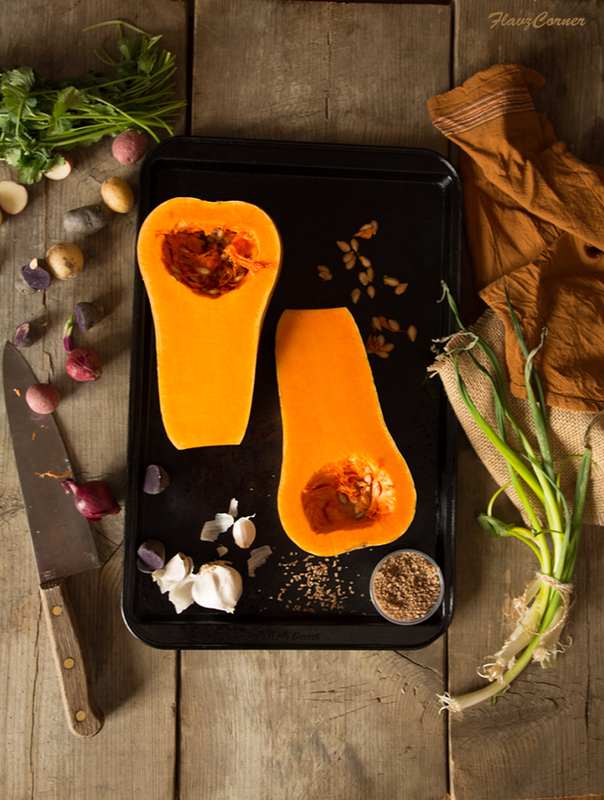 So go wear your apron and make a piquant Butternut squash boat! Brush the cut side of the butter nut squash with oil and place it on the baking sheet with cut side facing up. Lay the cut baby potatoes on one side of the baking sheet and drizzle some oil. Sprinkle salt and pepper over the cut squash and potatoes. Bake it for 30 minutes. 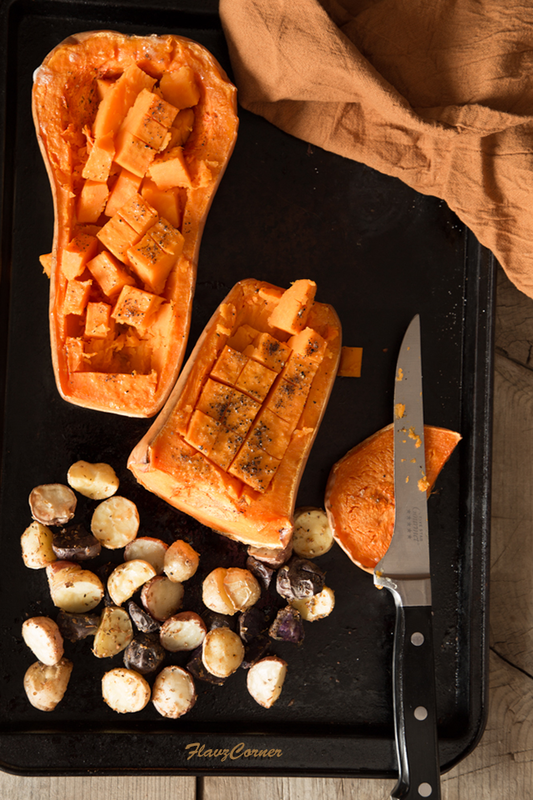 Once the squash cools down for 10 minutes, use a sharp knife to make lining on the baked squash; carefully either scoop out the flesh or cut it into squares as shown above in the picture and separate it out using the knife without tearing the skin of the squash. Cook the buckwheat with water/vegetable broth. Simmer the flame once the liquid boils and cover with the lid and cook till the grains are fluffy and cooked well. Heat a pan with 1 tsp of oil and cook the minced garlic, onion till light brown. Add the chopped green onions, pepper powder, Cajun mix and saute till raw smell is gone. Add the cooked buck wheat, scooped out butter nut squash flesh/cubes and the potatoes. Mix well and adjust the seasoning per your taste. Add the cilantro leaves and turn off the flame. Fill the squash boats with the filling mix. Top them with the cheese blend. Bake it for 5 to 10 minutes till the cheese is melted. Serve them warm with a side of the rest of the filling. This sounds so good especially with the cheese. I agree with you, back in India, there's so many varieties mums would make for fasting season. It's always a challenge now. I'm sure your kids gulped this down. Hope you are doing well Shibi. So delicious and beautiful! I am so jealous that you can still get butternut at this time of year. It's my top favourite squash. I'd certainly enjoy eating this! Tons of flavor in this, and love the colors. Really appealing -- thanks. It looks so beautiful and yum too... Perfect one for lent season... As a kid, I used to waste food and my mom had to advice me every single day but now I realize how difficult it is to create food right from the time it is grown to harvest and until it reaches our house and also to cook. I feel so guilty for having wasted food while I was small.